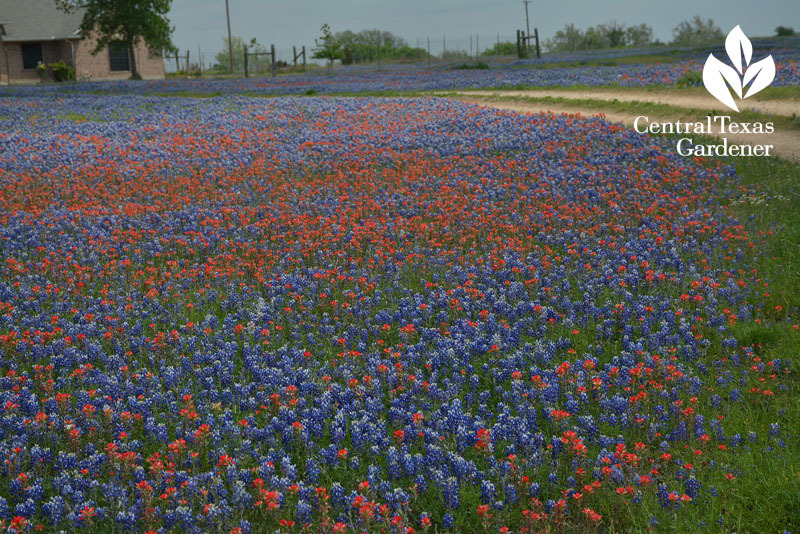 We’re not all so lucky to have a wildflower front yard scented with acres of bluebonnets and Indian paintbrush! 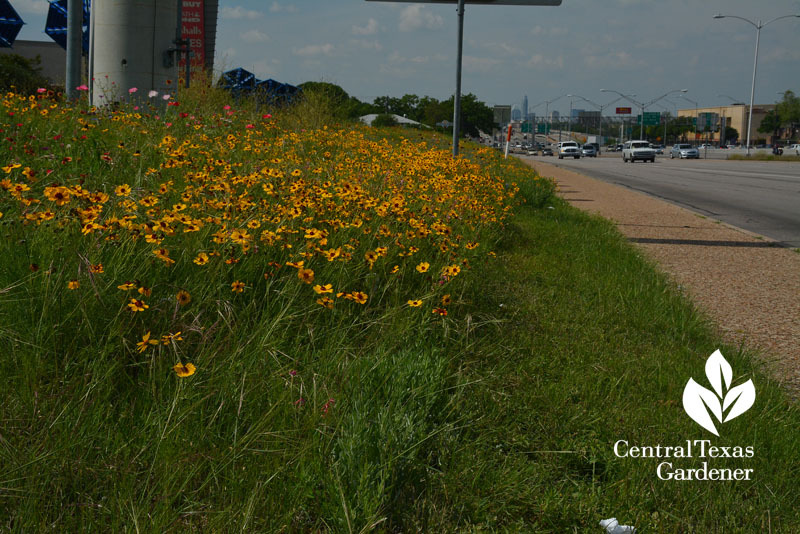 At least I get a wildflower pop driving home every day past the Mueller prairie strip along I-35. 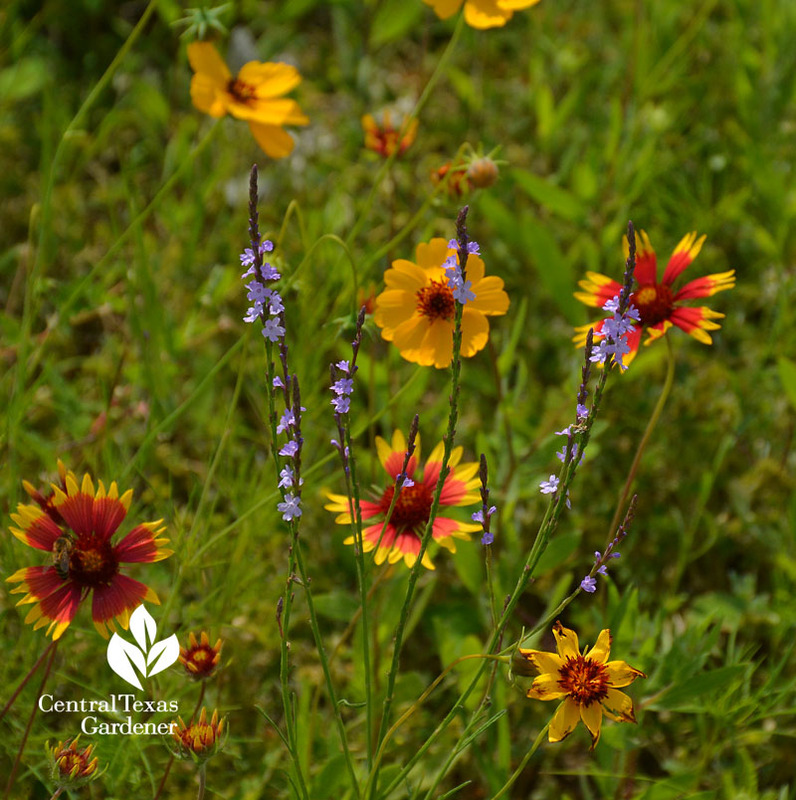 Most of us can’t have our very own prairie, but we can go a little wild in our gardens. 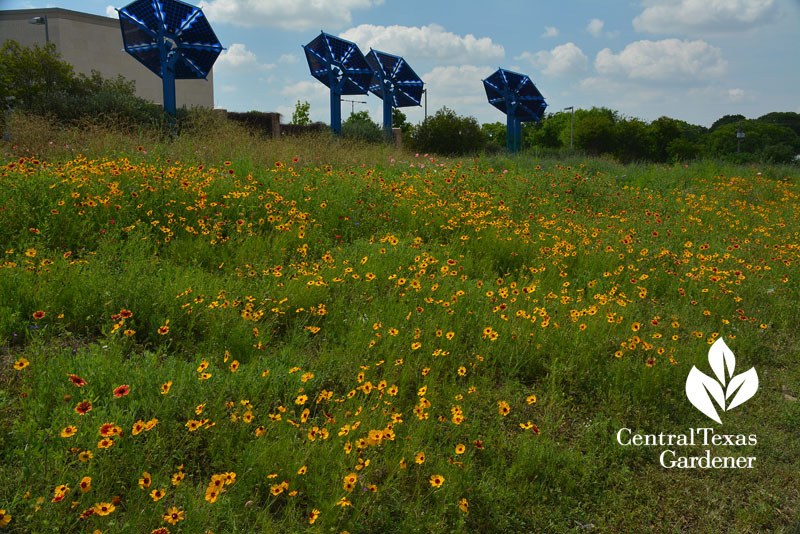 At Mueller, I spied spikes of lavender Texas vervain (Verbena halei) among Indian blanket and Thelesperma. I used to have some vervain until things got too shady. Now I have a sunny spot where I’ll seed next fall. 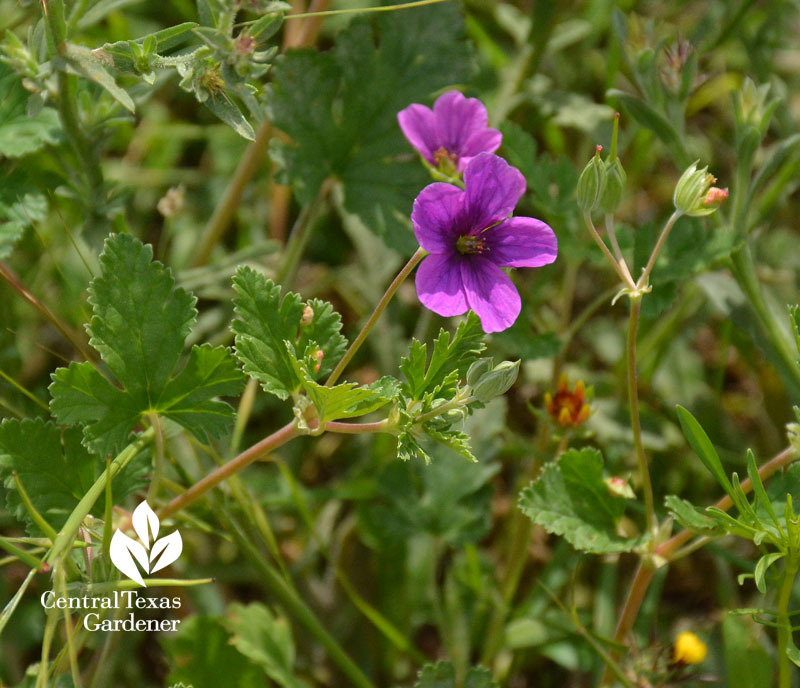 I’m tempted to try Erodium texanum, since it’s growing only a mile from my house. 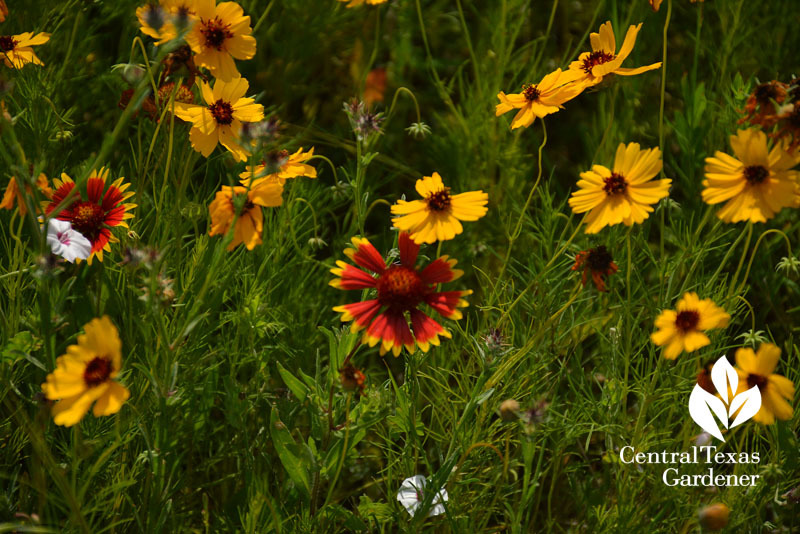 That sounds great, but I’m on flat Blackland Prairie, not on a scruffy soil slope. 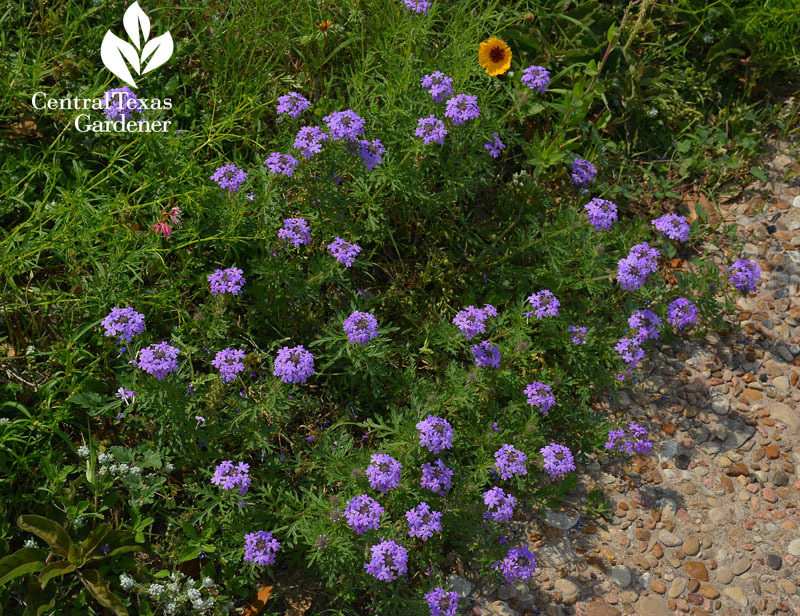 But I do qualify for purple prairie verbena (Glandularia bipinnatifida). Indeed, what’s native to rocks or sand is not native to my soil. 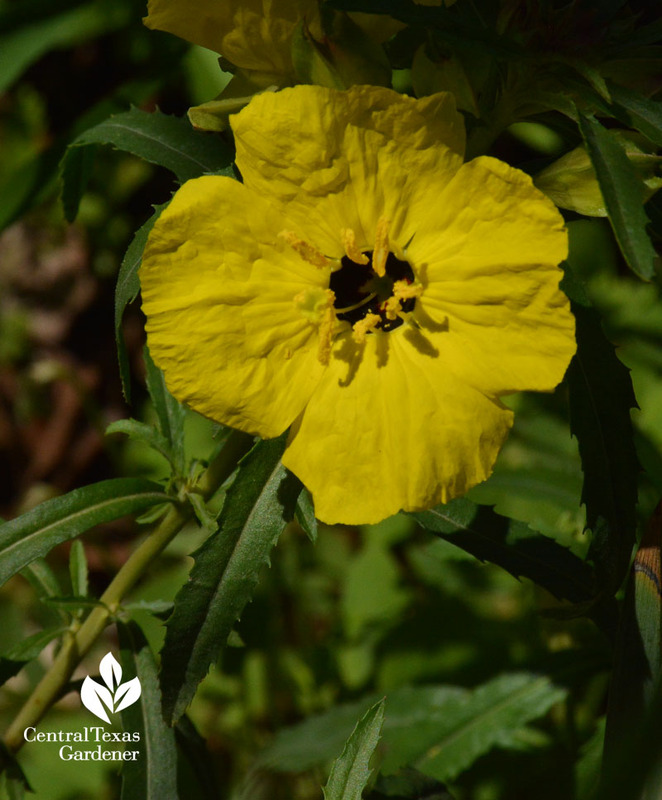 Many are adaptable, like Engelmann’s daisy. Calylophus berlandieri isn’t the best choice for me, but it works where I’ve given it extra grit in the looser spots. 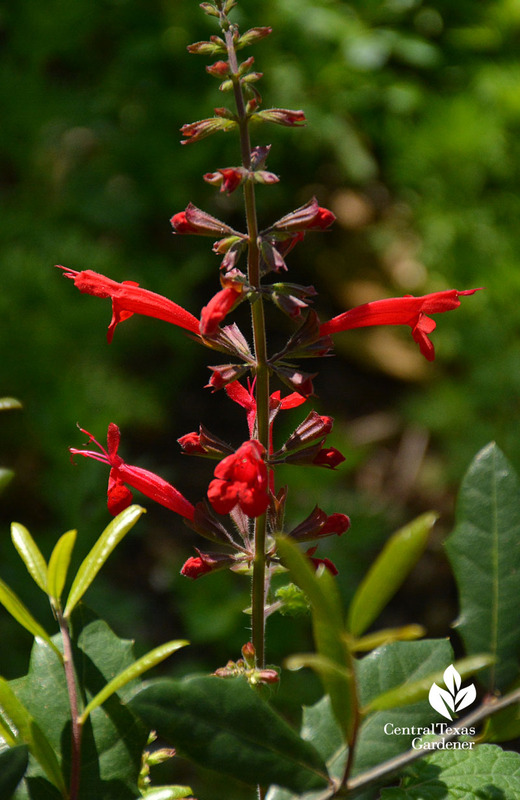 After a few misses, I found a perfect spot for spring-blooming Salvia roemeriana. 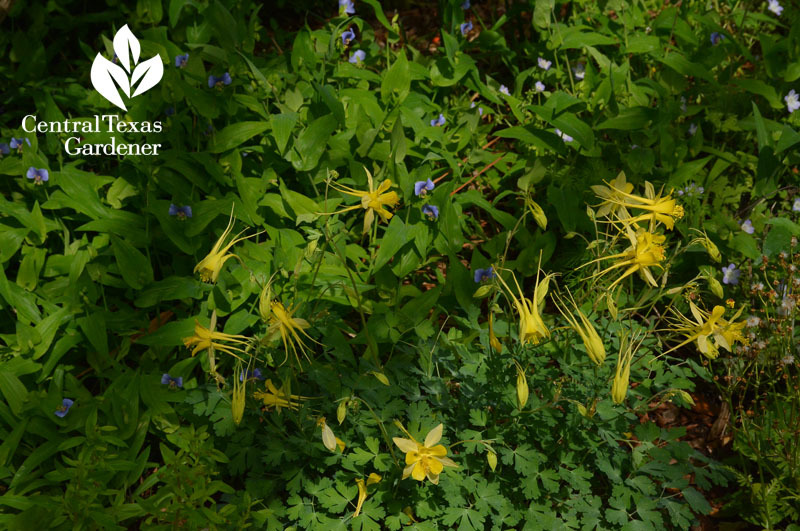 I finally figured out where columbine is happiest for me, here joined by really really happy Widow’s tears (Commelina erecta). 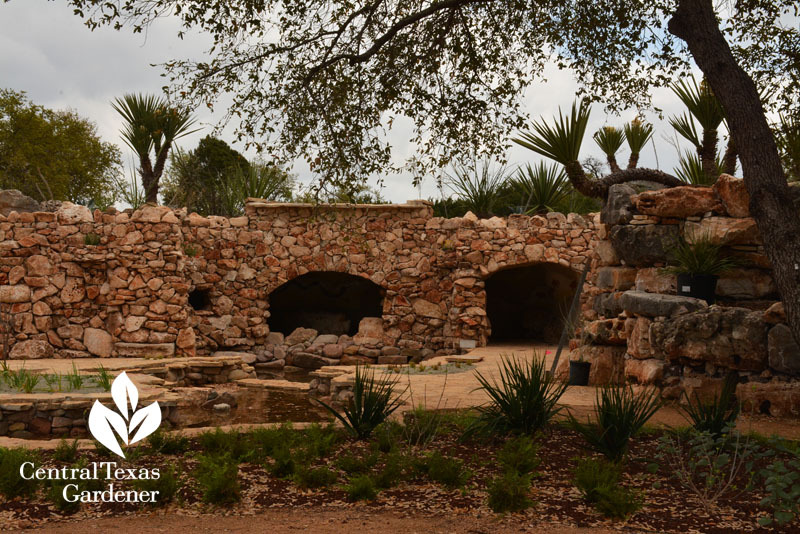 I rely on the Lady Bird Johnson Wildflower Center’s native plant database to keep me on track. 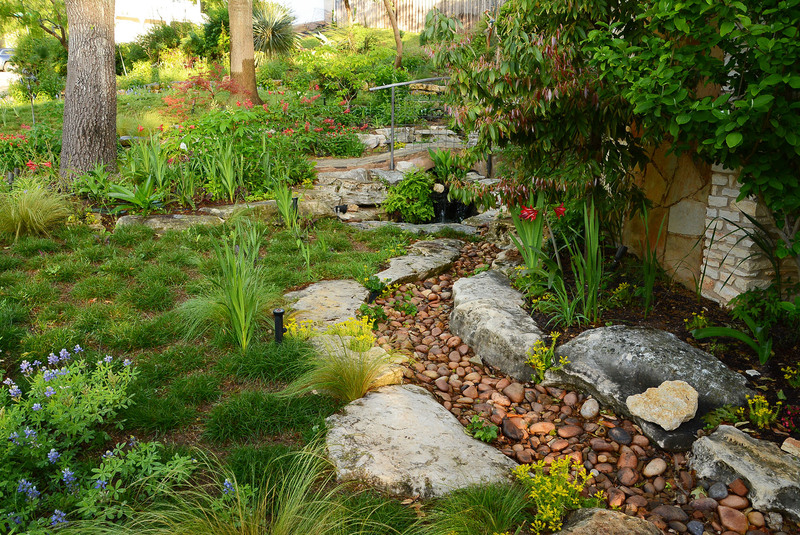 Also, the City of Austin’s Grow Green program now has a fabulous searchable database by soil type. 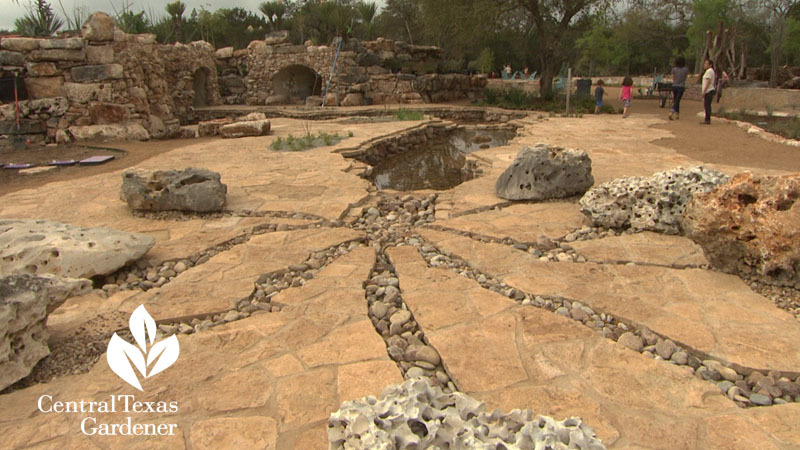 We’ve all learned that some plants simply move themselves to the right spots. 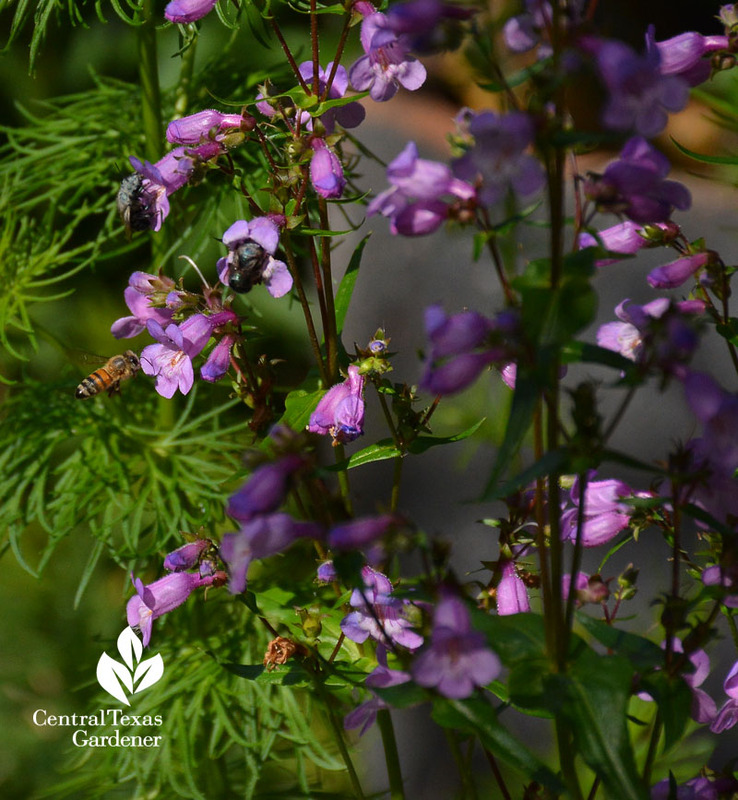 That’s the case with my Gulf penstemon, a busy bee right now. Aside from conserving water, wildlife is tops on my list to choose natives when I can. 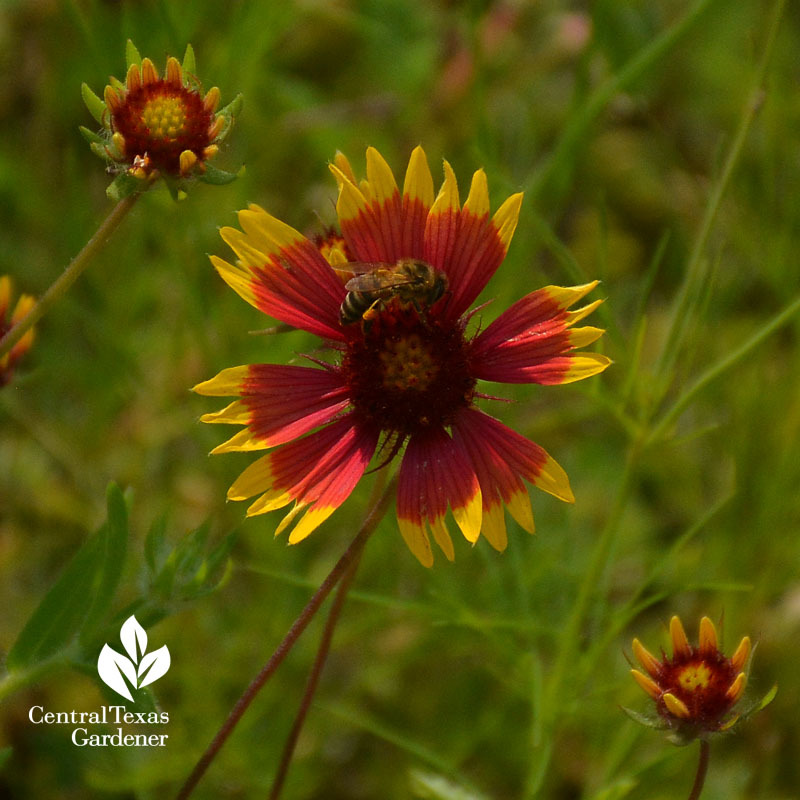 Bees love wildflowers, even the seed heads on Indian blanket! 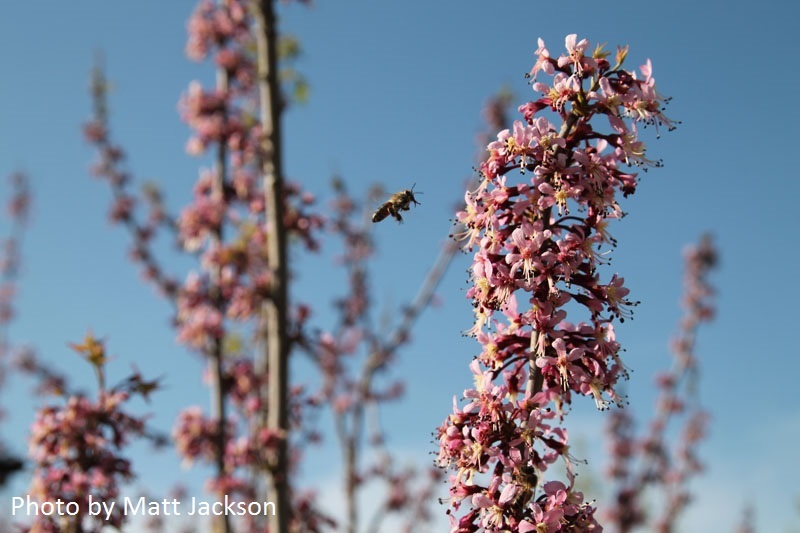 I’m totally impressed that Matt Jackson snagged this shot of a bee heading to Mexican buckeye on an energetic park romp with his young children! 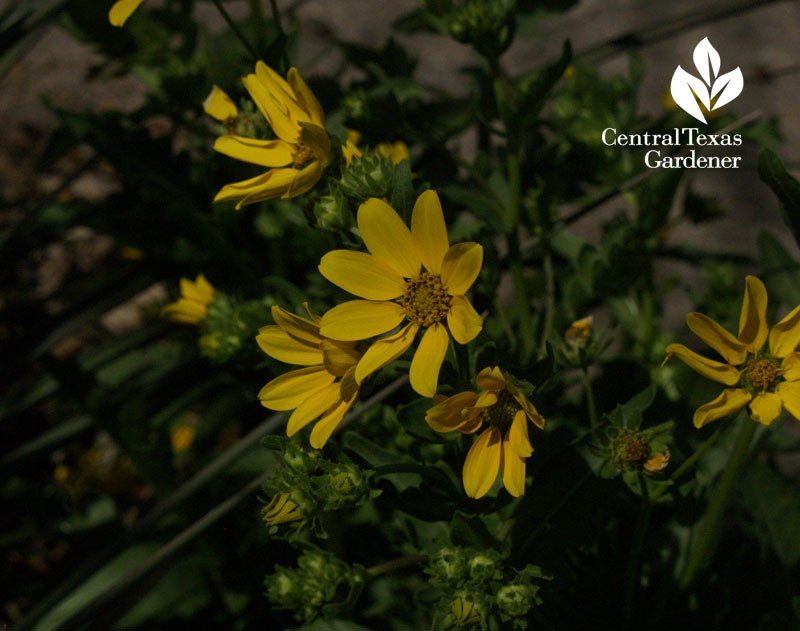 In the right spots, native plants will increase their population without our help. To up the ante, this week John Dromgoole shows how to take cuttings. 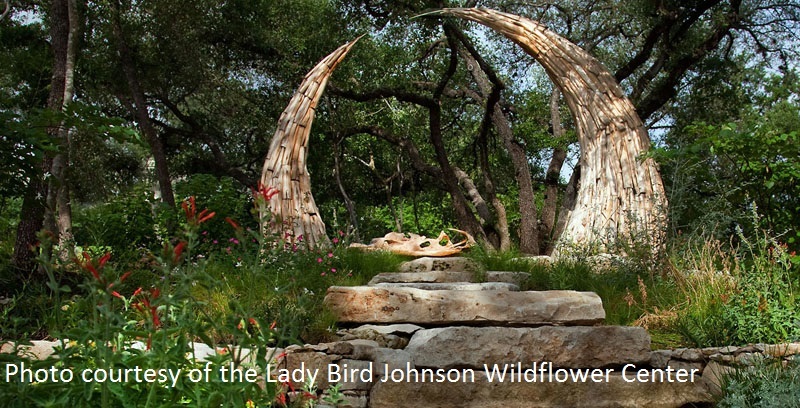 10 years ago, the Lady Bird Johnson Wildflower Center launched its Mother’s Day weekend Gardens on Tour to help us visualize native plant designs in our gardens. 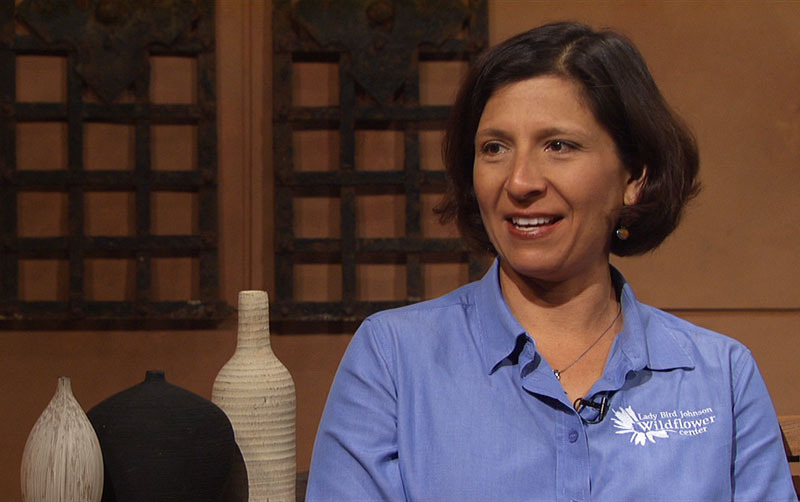 This week, Director of Horticulture Andrea DeLong-Amaya joins Tom for a preview of this year’s May 10 tour. Put on your walking shoes, grab your camera and get the details! 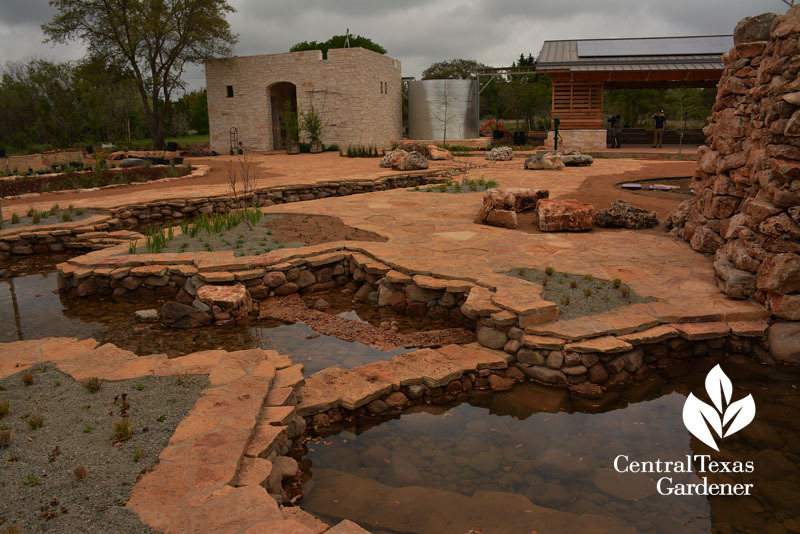 The Wildflower Center is on the tour, of course, and you don’t want to miss the new Luci & Ian Family Garden that opens May 4. 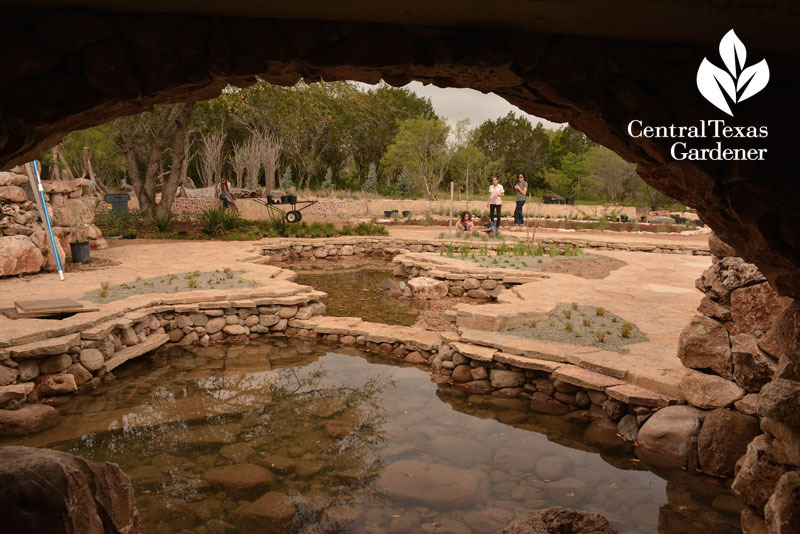 15 years in conception with lead designer W. Gary Smith, it’s an adventure in imagination and fun with “secret” messages on watershed care, water management, and native plant wildlife connections. 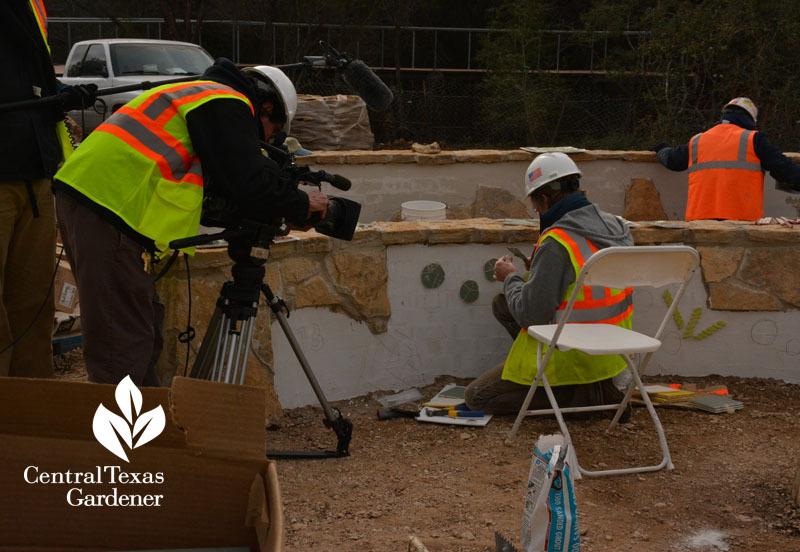 Here’s director Ed Fuentes taping Gary as he installs intricate tiles in the spiral based on plants with spiral flowers or forms. Plants like Turk’s cap and ferns with furling fronds complete the theme. 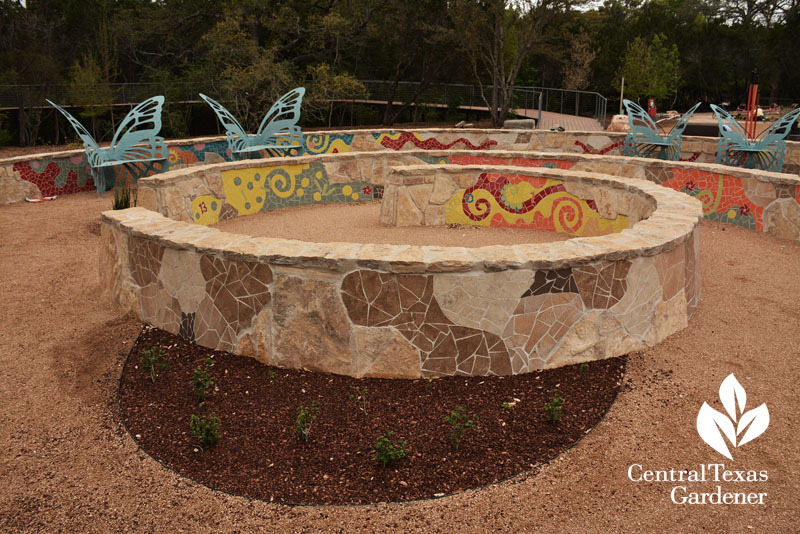 The garden extends Lady Bird’s mission in a garden where kids can run, explore, and play. 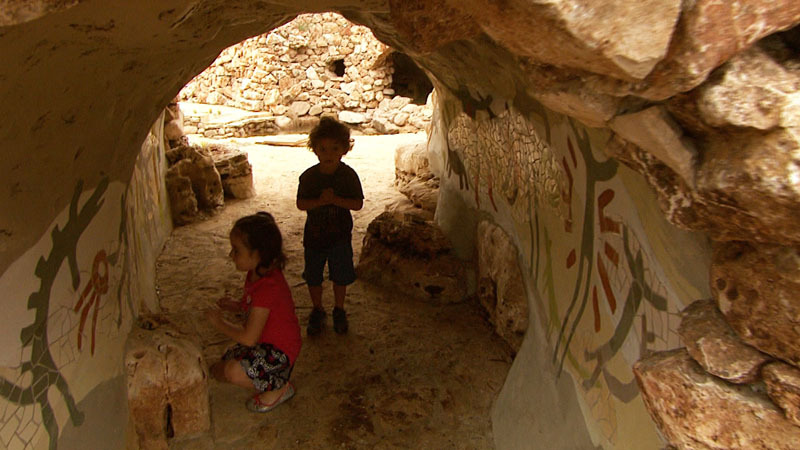 Instead of instructional signs, Gary’s designed interactive elements to inspire the powerful childhood transformation that sticks with us as we grow up and buy our first house and make our first garden. 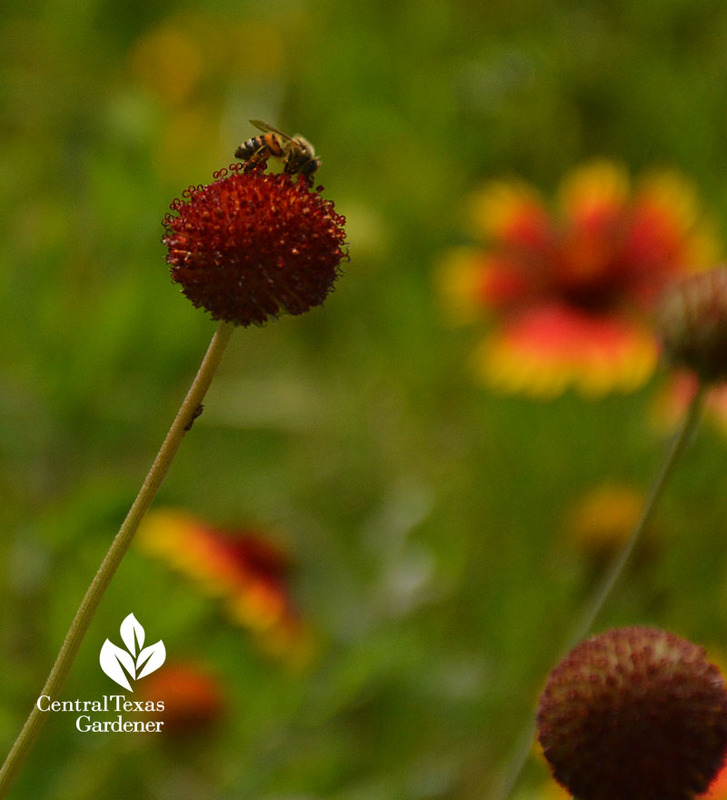 Gardeners can frolic and wander, too, while getting plant ideas for sun, shade, and rain gardens. Lots of volunteers recently finished planting, so it’s a great way to connect to complementary textures and spacing for brand new plants.